What are my options for managing references? How do I choose? allowing you to add your own annotations, tags, links. This guide is meant to assist in selecting a tool that serves your needs, and to offer links to help resources. What are the alternatives? Which should I use? Which you use depends on the features or functionality that you need. If you need only to generate quick citations, the “saved items” function of LibrarySearch may suit your needs. If you want to save citations for later use and organize them in folders, either Mendeley or Zotero support those purposes. Below is a Venn diagram that compares the two, and there are links to other comparisons below. 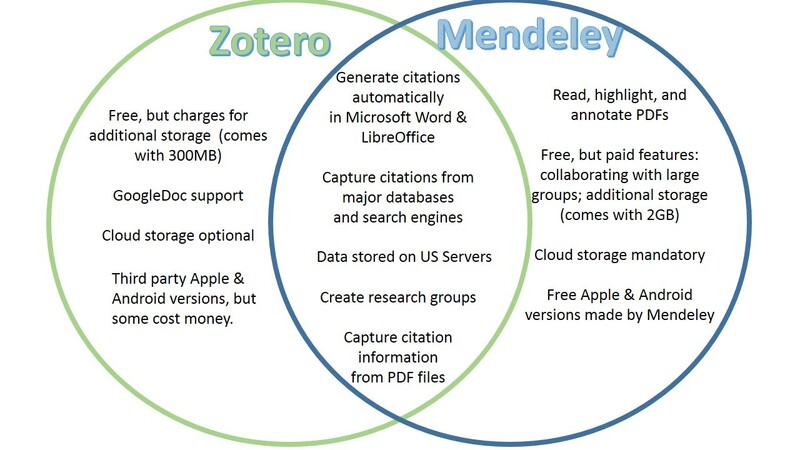 Adapted from York University Libraries' Zotero vs Mendeley Comparison as well as a comparison Venn diagram from University of British Columbia Libraries.